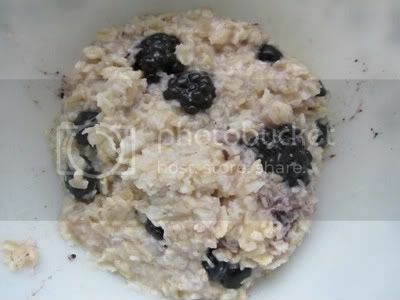 1/2 cup oatmeal with a handful of blueberries and blackberries, plus a tablespoon of unsweetened coconut flakes from the bulk bins at Whole Foods. The berries were super sweet, it was wonderful. I thought about going to the gym, and then realized that laying down on the couch sounded a lot better. I ran 3.5 miles on the lake shore paths on Friday and just missed the bus home, so instead of waiting for the next one, I just kept walking until I got home - about 6 miles. Add in a mile and a half of walking to/on the lake shore path earlier, plus a little sunburn, and my whole body was still quite tired on Saturday afternoon. 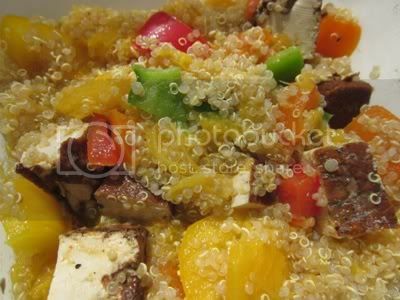 Quinoa with mango, rainbow peppers, and baked tofu. I sat on the couch, crunching away, and decided I felt like sleeping some more. So I put my bowl in the sink, drank some water, and passed out ... for another three hours. When my body wants to sleep for five hours midday, I need to listen to it and just let it happen. I haven't taken a proper rest day in a while - my last few have been pretty active, with walks at least 5 miles long. So it was really kind of nice to just curl up and let my body recuperate. Bok choy, and a mix of spinach, kale, and collards that I tossed up with garlic, two diced tomatoes, a handful of diced rainbow peppers, and some spices (my Usual Suspects - cumin, chili powder, and red pepper flakes). Nothing makes me smile like a progress collage. I really love cooking - structured and repetitive, it's always been something I do to calm my stresses. So I love that I can still do it in a healthy way, without going overboard with my eating. For today's recipe, I'd like to share a delicious treat I made for Sarah's birthday fête: date nut truffles. Think Larabar, but in a delicious poppable form. I made two varieties: chocolate orange and ginger snap. Oh my goodness, delicious. 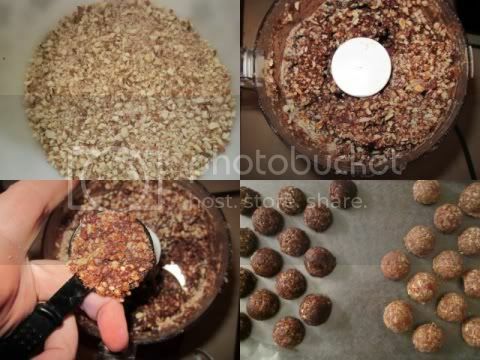 Grind almonds in a food processor until very fine; set aside. Chop dates in a food processor until finely chopped. Add in your spices, coconut flakes, and almonds, and pulse until well mixed. Using a melon baller or tablespoon measurer, scoop out truffle-sized balls and place them on waxed paper - it should make about 15 truffles. Refrigerate until ready to serve. I then decided to take them to the next level and spoon over some melted carob chips - the chocolate orange ones I covered, and the ginger snap ones I just drizzled with leftover carob. Delightful, chewy, and sweet without being overpowering. Like many vegan desserts, it's important to keep in mind that "vegan" doesn't mean fat free or calorie free (for these, the ginger snap ones are about 90 calories each, and the chocolate orange ones are 100 [with carob]). It just means no animal products and less processed, and you can hopefully feel a little better about enjoying it. What about you? What's something delicious-yet-healthier that you've enjoyed lately? Found your blog today, I am in awe of your progress so far. And I love how you write so honestly about your journey. The process collage is very impressive. Yummy food and you are doing a great job, Mary! I've just drooled over my keyboard. I love anything chocolate orange. Yummy! Oh, my those look yummy. I do love that collage of yours. You look so comfortable in the kitchen - a woman on a mission! I am trying to make healthier versions of pad thai (not an easy task) and have been scouring the Net for good recipes. 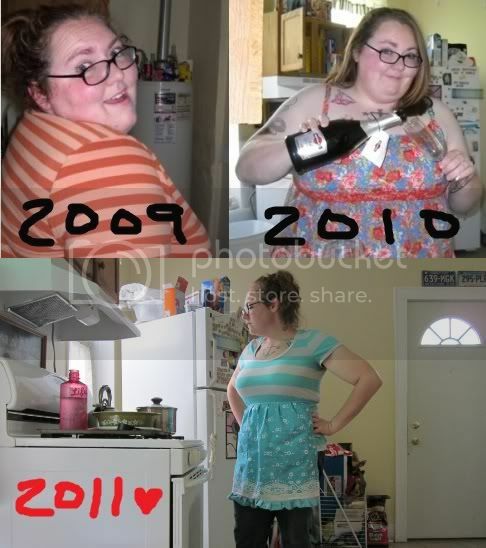 Your progress picture is AMAZING, and that food looks DELICIOUS!! The truffles look awesome, but not as awesome as YOU look! Those date truffles look great! Healthy sweet snack??? Sign me up! I will have to try this sometime. You are looking fan-freaking-tastic. Keep at it!